Obituary for Doreen Smith | Binkley's Funeral Service Ltd.
Doreen J Smith, née Gardippi, died on January 31, 2019 at Maple Creek, Saskatchwan. She was born July 1936 in the "bench" country south of Piapot, Saskatchewan. Doreen attended Piapot school, later working at Bowies General Store. She married Reynold (Rennie) Smith in 1955. Living on the family farm, they raised a family. Doreen worked as a cook at the Crossroads Cafe, Cypress Lodge, and the hospital. After retirement, she started two restaurants, T - X and The Roundup. She loved to cook and enjoyed meeting people. The restaurant gave her the chance to do both. Due to poor health, she closed her business and had back surgery in 2016. She never really recovered her health and passed away two years later. 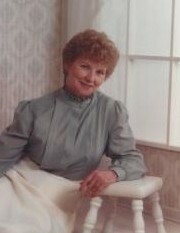 Doreen was preceded in death by two sons, Reginald (1963) and Kimball (1960) and her husband Rennie (1983). She is survived by her children Leona, Holly, Douglas, Melodie, Renee, and a foster-daughter / cousin Annetta, also her grand children, great grand-children, and a brother David. Doreen had many happy memories of her "bench country" childhood, playing by the creek and picking Saskatoons. She loved life, children, gardening, cooking, and her pets. Many speak of her pies.